The Workers' Communist Party of France (French: Parti communiste des ouvriers de France, PCOF) is a minor French Marxist-Leninist political party. 02/2007 issue from "La Forge" with the old logo having the hammer and sickle symbol on the left. 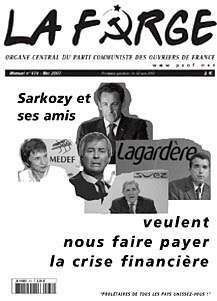 09/2007 issue from "La Forge" criticizing president Nicolas Sarkozy's government. The reader can see newspaper's new logo. The PCOF was established in 1979. It supported the political line of the Party of Labour of Albania. The PCOF is an active participant in the International Conference of Marxist–Leninist Parties and Organizations (Unity & Struggle).